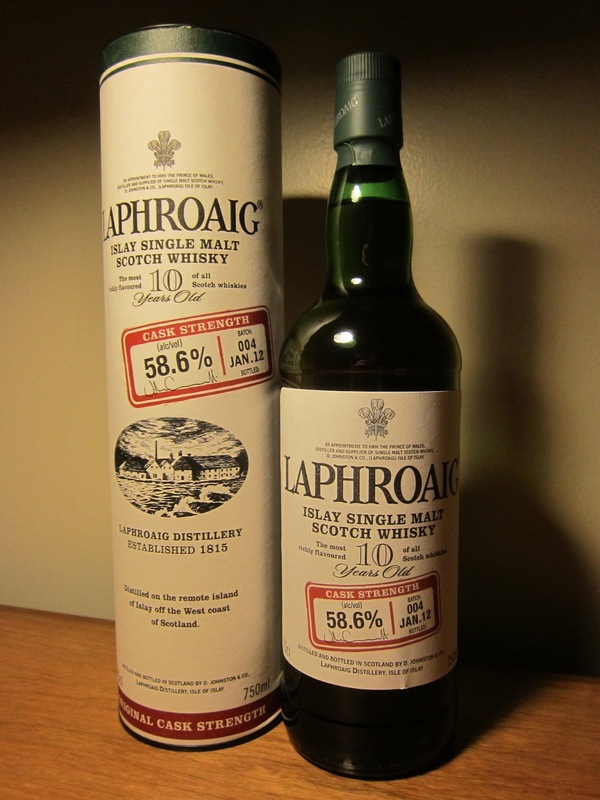 Laphroaig 10yo Cask Strength Batch 004 (58.6%): Third big snow storm of the season in New England, it's Friday night and been a long week. So, I think nobody could have a better suggestion about what to pour tonight. Laphroaig Cask Strength it is... The whisky has the batch number 004 and bottled in January 2012. Color: Shines like polished red gold. Nose: Cold sea spray, seaweed, diesel fuel. My hands used to smell like this as a teenager after coming back from fishing and steering the small wooden boat from the oily handle of the outboard engine the whole day. A few drops of water add latex gloves aromas with sweet barley cookies right out of the oven. Palate: Felt like biting a chunk of hot peat. It covers inside of the mouth with a layer of liquid fire place ash. Hot (by all means), sweet and salty at the same time. Like ripping a piece of a warm French baguette and spreading a cube of salty butter on. Chocolate covered salted caramel bites and crunchy toasted barley bits. Water cools it down a little and allows some cooked dried zante currants, dry clay soil and cheap cigarillo notes to show up. Finish: Lingers forever... Black pepper, ground ginger and fired shotgun shells. Overall: Wow, that was a ride... This guy definitely takes no prisoners. It lifts you up, shakes, spins around and puts you back on your couch with a huge smile on your face. Right away you want to do it again. Layers and layers of complexity you peel one by one by adding water. It's a huge and muscular dram. Like I said nobody could pick something better for tonight. Thank you to Simon Brooking for the official sample..!